Today on homify 360°, we indulge ourselves with an ultra luxurious treat that resembles a five-star hotel, yet is still a residence to a suburban family. 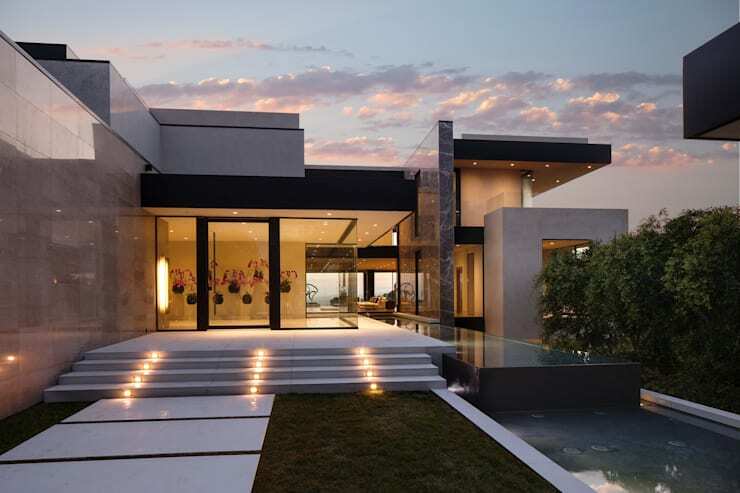 Located on a hilltop in one of the most desirable locations in Los Angeles (mere minutes away from Sunset Strip), this glamorous structure enjoys a peaceful ambience made possible by the surrounding landscape. McClean Design architectural firm receives all the credit for this stunner; their task begun with a long and narrow stretch of land that offered a primary view from only one end of the lot. They offered a solution of creating a compound of three buildings: the main house, garage and a guest house. 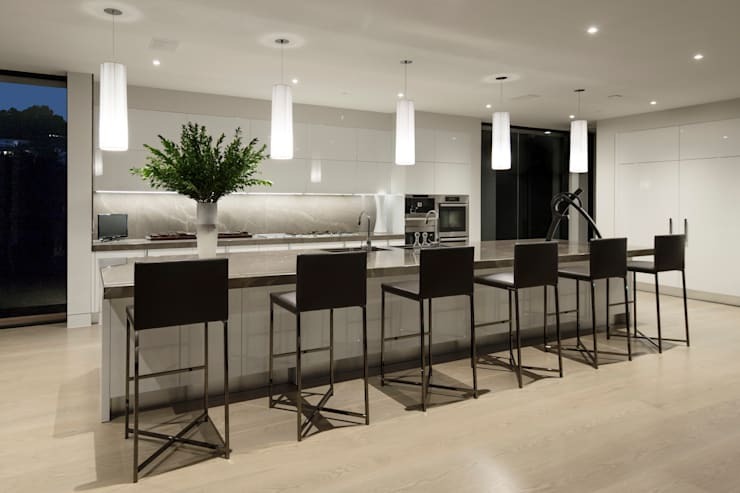 What the homeowners ended up with was an ultra magnificent conception that offers modern features, chic finishings and a plush setting: enough to make anybody wish they owned this far-from-humble home. Getting access to this superbly modern creation takes us through a gated driveway, as well as a guard house. A water feature marks the main house’s entryway, with a short and stylish staircase leading to the front hallway. Typical of the modern style, an asymmetrical balance can be seen in the layout. Marble, tile and concrete are all decked out in the neutral palette, which lends an elegant vibe to the house. Clear slates of glass create an open and welcoming entryway, and allow us to see literally through the house to the landscape at the other end. And what a hallway greets us! As first impressions go, this is a dazzling manner to greet your guests. Glazed, open and stylish, with a crisp white colour tone to add to the chic ambience that seems to flow everywhere. A striking art piece on the wall adds a touch of contrast to the clean aura. This is neatly balanced by the bright pink sprinkles of florals, stunningly embossed by means of the white wall behind them, serving as the clean canvas. 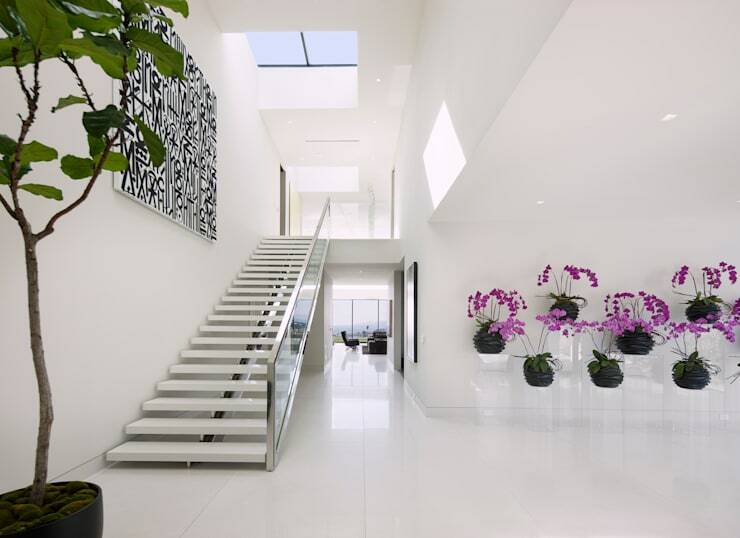 A stairwell decked out in beautiful chrome and stone leads to the upper level bedrooms. Up ahead lies the living room, while a turn towards the right will lead us to the dining room. Any room which has ceiling lights resembling upside-down champagne flutes cannot help but be stunning. A delightful mix of whites and darks encompass the kitchen, with a sizable island to end all kitchen islands. The kitchen and family room share a combined space, and present a more intimate and cosy atmosphere than the living room. A view from here takes you all the way back along the water feature, past the garage and the guest house, and even further on. Wonderful views of the city below can be glimpsed from here, and direct access to the backyard is granted. No, we did not suddenly cross over into a large hotel resort – this is just the main living room, occupying two storeys and providing spectacular views of the Los Angeles Basin and the ocean beyond. Excessive accessories and decorations have been avoided, adding class and even more space to this gigantic room. 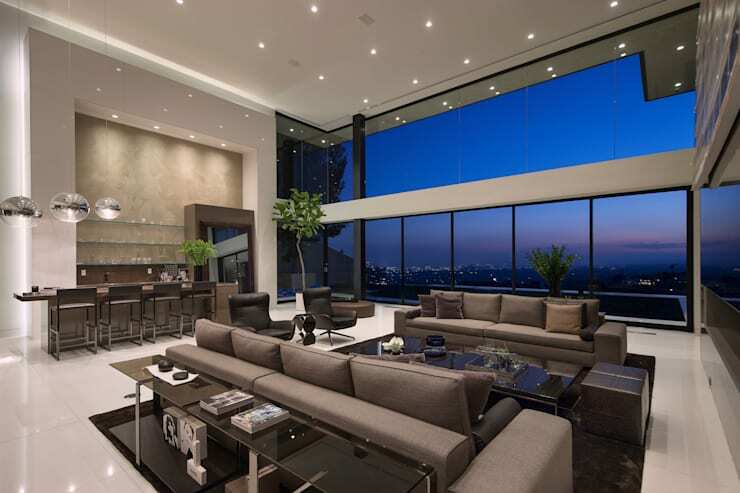 Clean lines, along with those ever loyal neutral colour tones, govern the room splendidly. Oh, did we mention that the room also incorporates a bar, a glazed wine cellar, and an elongated view through the fireplace which stretches into the family room on the other side? Quench your curiosity with some more spectacular wine cellar inspiration. Ascending that magnificent staircase takes us to the master bedroom. The dreamy tiles of the ground floor gives way to a sandy wooden finish – perfect for walking around barefoot. And what could be more wonderful than your own modern couch in the bedroom, ideal for some late night reading or stargazing. The sliding panels of glass open onto the deck, where a morning coffee and faultless view of the city below awaits. Clear balustrades have been (ingeniously) used in order not to impact on that view in any way. An expansive walk-in closet (or should we say ‘room’?) that is decked out in wood and glass. Here we have a multitude of shelves, drawers and spaces just begging to be filled. Clean, white and stylish – the perfect backdrop for a wide array of colours, textures and fabrics. 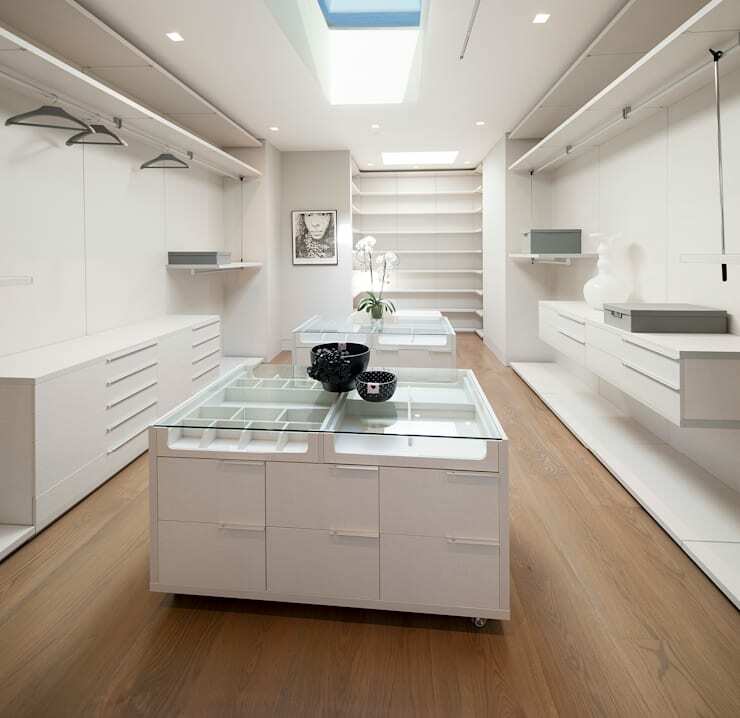 And what personal closet is complete without a skylight? See these Six Walk-In Wardrobe Ideas when it comes to dressing in style. We conclude this superb tour with the his-and-her bathroom, complete with large closet areas. The clean lined design of the wall ensures a touch of activity, with a blue comet tone to give it that tranquil feeling. All the material palettes have been designed to be warm and contemporary. Polished stone and added wood have been made use of extensively. Italian furniture and fixtures superbly adorn the kitchen and bathroom, while the windows and doors sport bronzed aluminium. 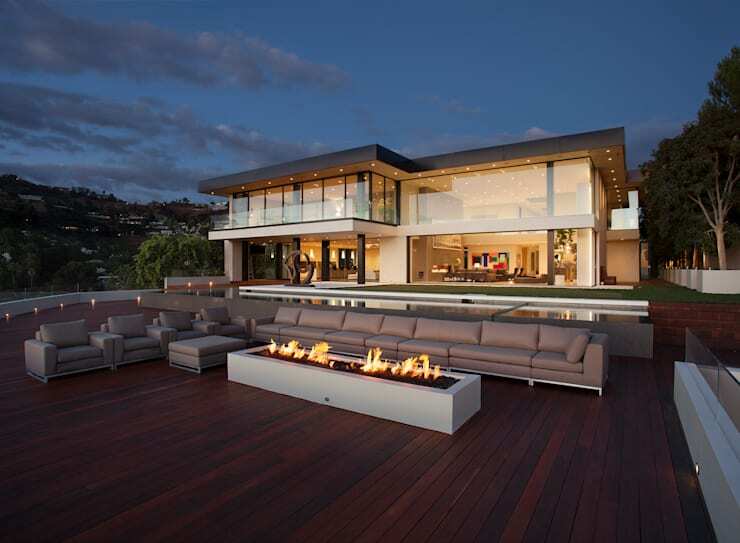 A superb collection of modern style and suburban perfection round off this utterly enviable setting. We float through the expansive glass doors, over the infinity pool, and touch down on the wooden terrace. This gorgeous space is designed for one thing only: entertaining large groups. An extended fire feature and comfortable seating has been elegantly added, ensuring an unforgettable and stylish outdoor social event in winter and summer. It is difficult to determine which view reigns supreme here: the view of the house with its open and smooth geometric styling, or the view of the city below. This ground-floor level of the house also presents the service spaces, as well as a private office for the owner. What a fantastic setting, simply not worthy of the word ‘house’. What would be your favourite feature?